I had heard great things about Kiwi Crate, so when they offered us a chance to review their product I jumped at the chance! 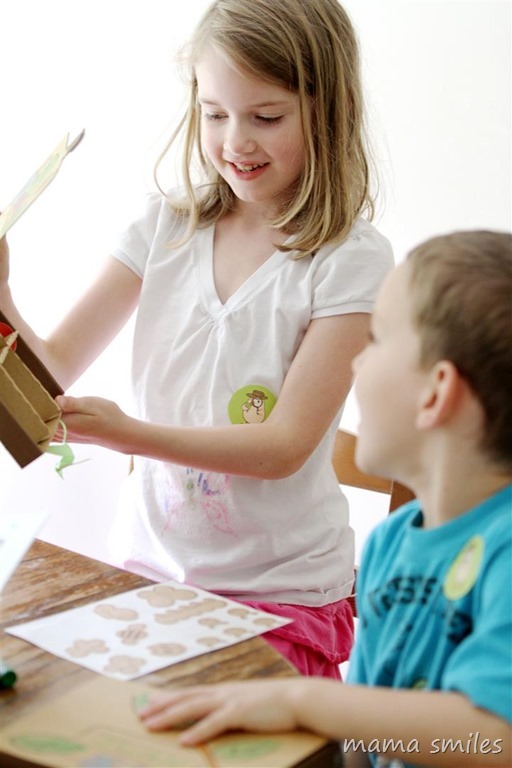 My kids normally have to share craft kits, so they were thrilled when Kiwi Crate sent us one of their double crates (with enough materials for two kids) plus a single, so that they could each complete all of the activities! 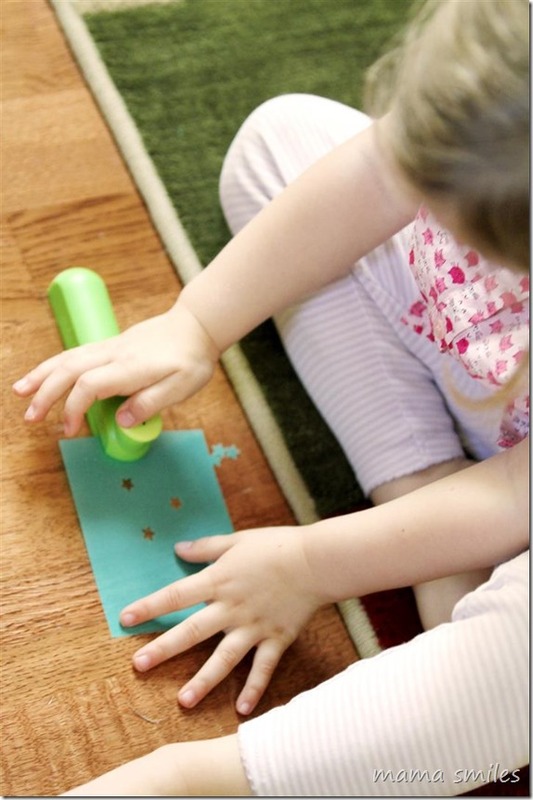 They really enjoyed putting together all of the activities, and I was impressed with the quality and thought that was put into designing these materials. 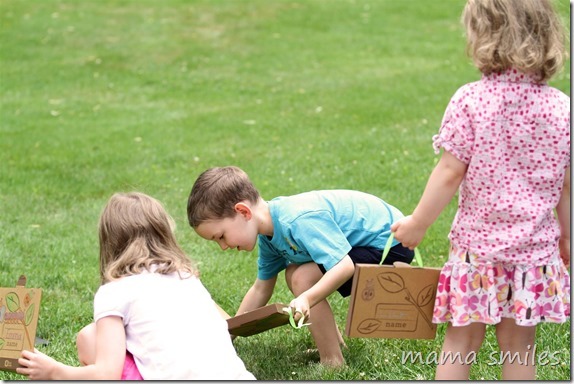 I also loved the way this scavenger hunt inspiring collection box got my kids exploring the yard – even on a hot, muggy day! They had a wonderful time collecting specimens from around our yard – it was easy (and, I think would be easy even with a small yard) for them to find each of the nature objects. Then they enjoyed bringing their specimen boxes inside and comparing what they had each found! My kids also enjoyed the DIY lantern that comes with the kit – and the star hole punch was especially a hit with three-year-old Lily! 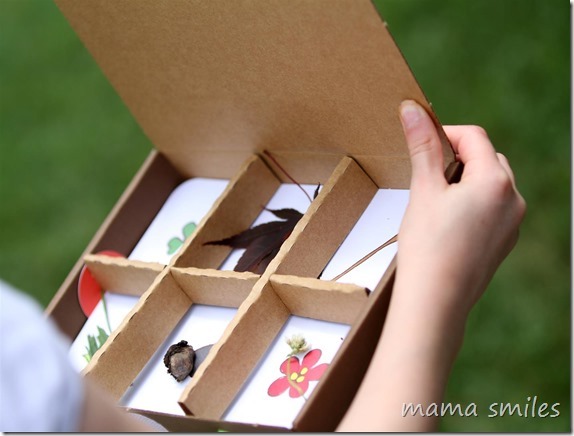 I should note that, while my kids were able to put the kits together mostly on their own, even seven-year-old Emma needed help with some of the steps – so I recommend these as a fun parent-child activity, not as a keep the kids busy so you can get stuff done activity. I loved that it was easy for the kids to use, and effective. I’ve bought some hole punches that don’t really punch through paper; this one did. 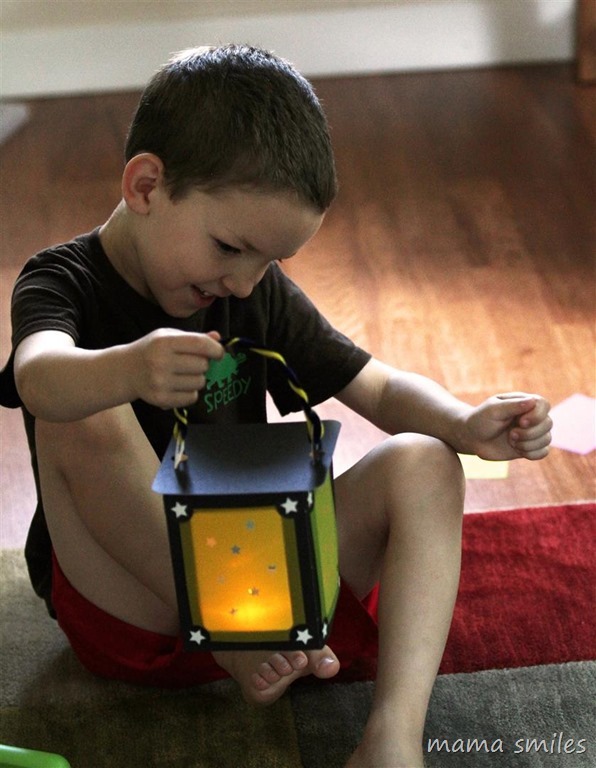 And what’s not to love about a lantern that gets you thinking about constellations (the kit comes with a booklet explaining constellations) and doubles as a night light! The kit also come with a very cute deck of cards. I think we’ll be exploring card games on our next rainy day! Intrigued? Join Kiwi Crate today! Kiwi Crate sent us their Nature Explorer kit to review. I received no other compensation, and all opinions are my own. What a neat kit! I love the scavenger hunt box. The box is very well designed! I also has different cards for different kinds of hunts (colors, and then make-your-own hunt cards). Yes, I heard great things about Kiwi Crate. It looks like your kiddos had a lot of fun with it. I’ve heard good things about them. Maybe we’ll try it someday. I can’t remember, is it a monthly thing or a one time service? 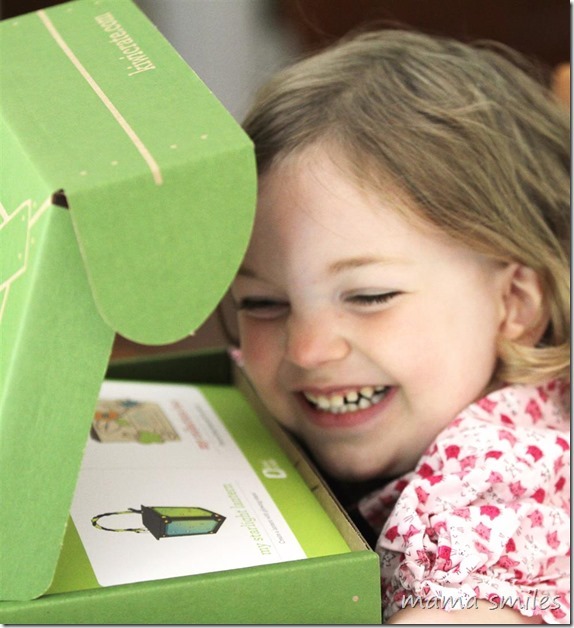 It is a monthly thing, but you can also order specific crates from previous months – best of both worlds! What a lot of fun and variety in those kits!! I love that they sent enough for each of your three big kids. Yay! It was really fun for the kids to each get their own – they loved it! I’ve never heard of that before. So do you go out and find things to put in the box? Yep! There is a card at the bottom of the box – this one was looking for specific things, but the kit also came with a color card, and a design-your-own-hunt card. I thought the constellation lantern was really neat – so well designed, too! Wow! That Kiwi Crate project looked fantastic. I have one but I thought it was arts and crafts so I haven’t tried it out yet. Guess I better check it out more closely. Their activities are very creative and educational. Not your standard craft kit! I have never heard of them but will definitely check it out. Thanks so much for sharing! I think you would love their crates! We like Kiwi Crate. 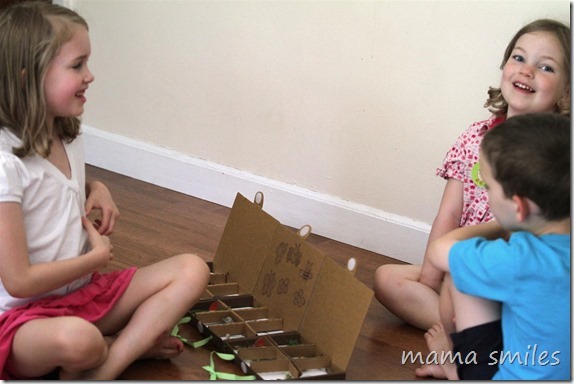 Their activities are creative, yet simple. They have a shop in Mt View too, but it’s only open mid-day (right through my working hours), so I haven’t been able to check them out. I bet their shop is really neat! I’ll have to check it out once we’re in the area. I drive by their office every week as it is right next to the girls gymnastics studio, I didn’t realize they had a shop though! Cool! We’ve been loving our Kiwi Crates, although some more than others. I was really disappointed with the board game one, it was basically a coloring project rather than a design project, but the music one from last November or so was my favorite, as it included encoding and decoding music with a color based system, and the girls could trade their songs and play them back, super cool. And with most of them Rebecca has been able to go off and do them with Penelope without any real supervision, although not all. I like the extension activities they often include too. The music one sounds great! I’m impressed that Rebecca can do them with Penelope without supervision, most of the time!